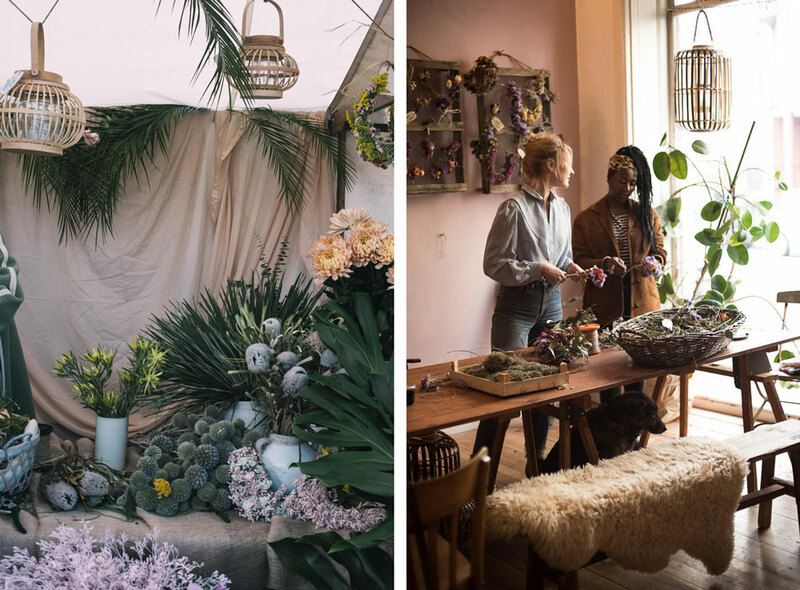 Their common love for drying flowers made Maggie Coker and Jasmin Lünstroth start Poems & Posies, a floral and interior design studio based in NeuKölln, Berlin. 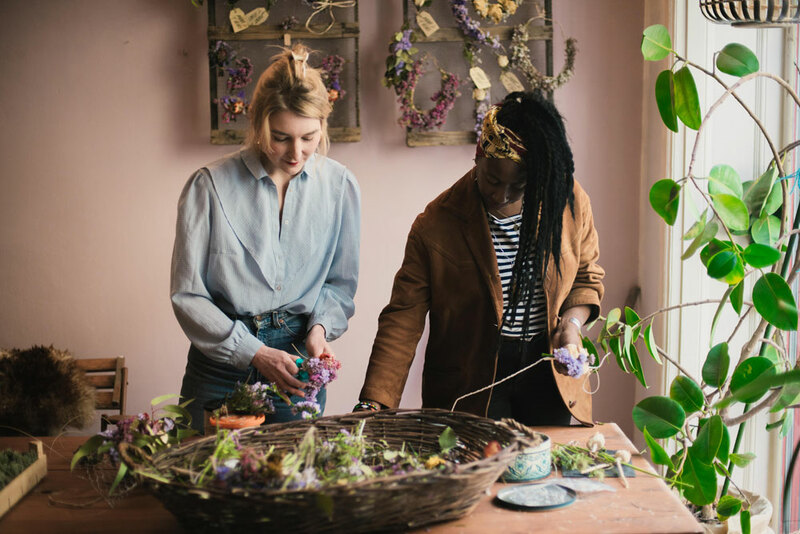 Maggie, originally from London, and Jasmin, from Bielefeld in Germany, want to highlight the beauty and range of dried flowers, whilst drawing attention to their sustainability and cost effectiveness compared to fresh flowers. How did you meet and what made you start Poems & Posies? Maggie: Jasmin was working at one of my favorite cafés. We got chatting one day and she left an impression on me. Months later, I was revisiting the idea of starting Poems & Posies. I had already written it all down on paper, but knew I wanted a partner to work with. I had told only my best friend the idea and he loved it. At that time I wanted to change the whole concept of vintage store ‘Rag And Bone Man’ and try out a shared economy model for a creative business space. I already had in mind an artisan for the back room, and was still looking for café partners. I really felt there was a space for a shop or café decorated with mainly dried flowers. For me food and flowers made a perfect match – eating good food while being drenched in flowers. So many places were using plants to give this jungle Instagram-friendly greenery appeal, but each time I sat in a new place full of plants I began to dream more of flowers. Initially, the idea was to start a flower bike service delivering beautiful dried flowers with hand written poetry. One day I was looking out of my kitchen window and along came Jasmin riding a bike full of flowers in her front basket – all wild and spilling over the front frame. I knew at that point she was the person I wanted to work with. Just before I went home to London for Christmas I wrote to Jasmin to ask her if she wanted to join forces. She happily agreed and we started to exchange ideas immediately and so began the Journey of Poems & Posies in winter of 2015. Jasmin had a lot of drive and ideas and we both craved change. 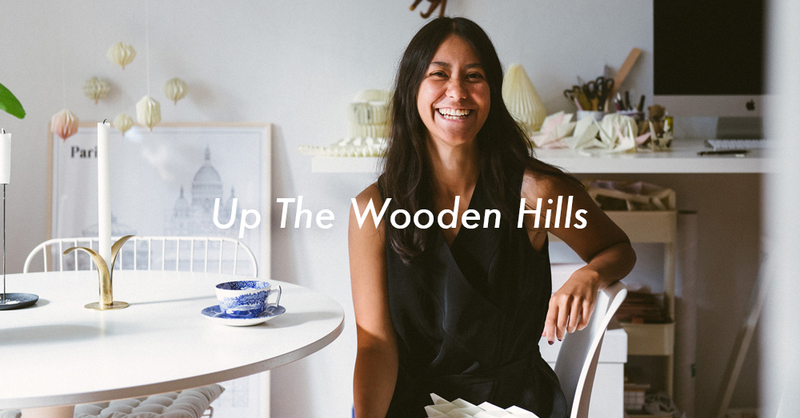 Once Jasmin moved into the shop, the big interior makeover began. 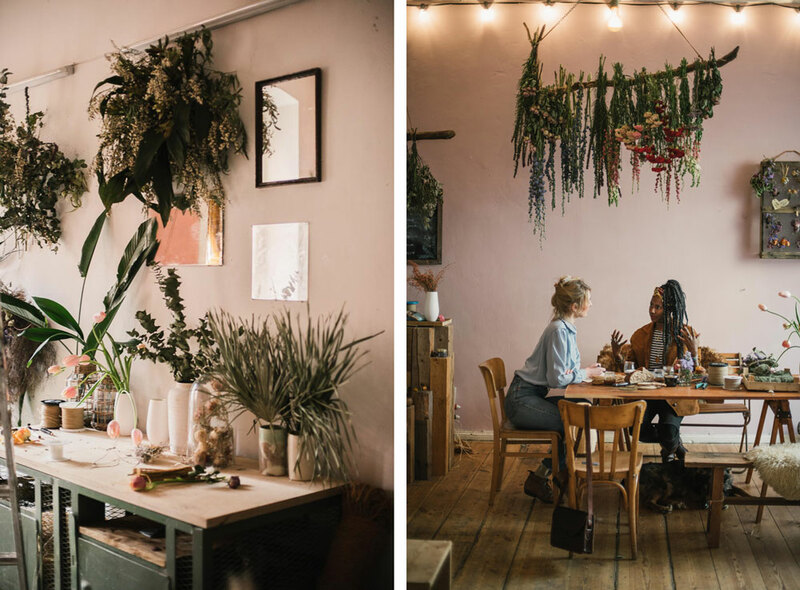 A month in, Jasmin told me about a duo serving really good eggs Benedict from a food truck – the concept was complete: café, textiles and flowers. The shop looked stunning and requests for collaborations started flowing in. But it wasn’t until we did interior styling for H&M home that things really started to kick off. Do you remember when you first got interested in flowers? Maggie: Growing up in a single-parent home, my dad didn’t have time to really take care of our massive garden – he was too busy working and cooking awesome meals for us. So I often watched in admiration when my Greek neighbour, with the big pretty teeth and friendly smile, attended to her garden. It was covered with a blanket of roses and, to this day, it’s quite possibly the best garden I’ve ever seen. She would cut a few different roses and explain to me where they were from and their type. She didn’t mind that I never replied – we had our own non-verbal communication of flower talk and she could tell I loved the smell, and that being close to flowers made me happy. Some years went by, I think I was about 10 years old, and without my dad knowing I took a Saturday job working for a very mean man at a local flower shop. Although he was not the kindest of people, I didn’t care as it was worth being around all the pretty flowers. After two weeks of him not paying me, he said I was too quiet and shy to work in a shop, and that it was best I didn’t come back. I felt really disappointed in myself for allowing my shyness to get the better of me, but I knew deep down inside I would return to working with flowers again. 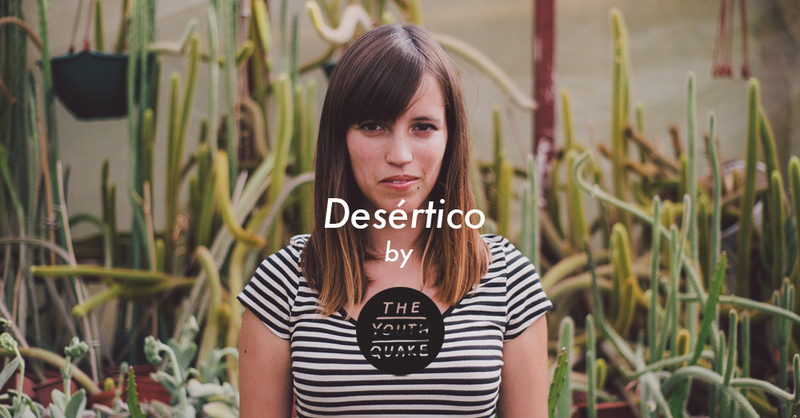 Jasmin: My grandma had the most beautiful garden and I often helped her with it – it was our special bond. She was one of the most loving and caring people I ever knew. Flowers played a huge part in both our lives and I guess it has stayed with me ever since. Being raised in a small countryside town you can’t help but to have soil in your finger tips. I have worked in different cafés and I have always ended up being the person in charge of making the place look pretty with flowers, and I loved it – it came very natural to me. A couple of years ago there was big change towards decor in Berlin and people started going crazy for greenery, cacti, banana plants, etc. It seemed like people started to care more about the interiors and taking more pride in their spaces. Maggie and I decided to put more emphasis on flowers and do something different by drying flowers and using them in our decor projects. What processes do you follow to dry the flowers you use? What are the main differences between working with fresh and dried flowers? Jasmin: We like to keep it simple and natural – we use dark cool spaces and no spray or chemicals. The flowers that want to dry will do so…aging beauties. Also, at times, our installations start off fresh and go through the drying process, for example our ‘Flower Wall’ for Christmas. Working with fresh flowers puts you on a time and weather restriction. We both enjoy autumn and winter for working with fresh flowers, but the smell, texture and colours of fresh summer flowers are dreamy and magical. What are some of your favourite flowers to work with? Maggie: I love peonies season. They are beautiful divas, big and bold, and they don’t need other flowers to make them look good. Wildflowers are fun and free, and I also love drying roses and Delphinium. Can you take us through the different services you provide? 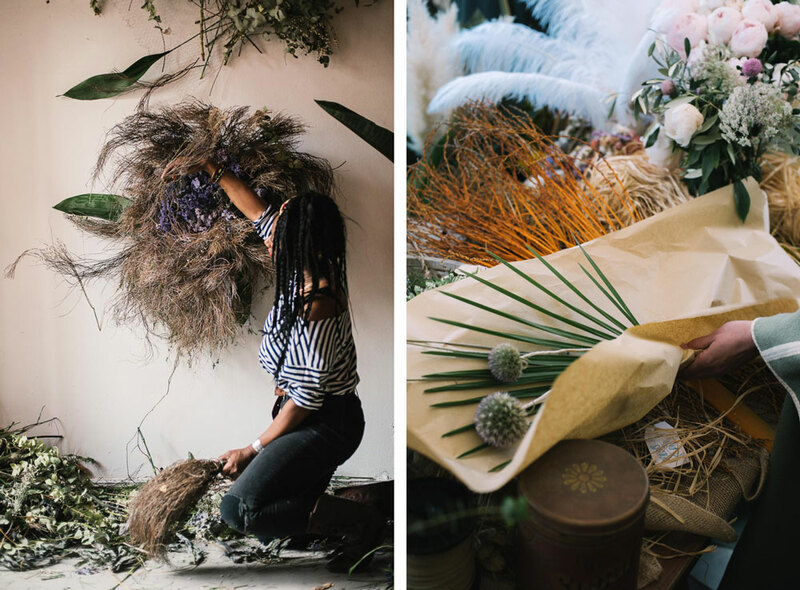 We’re especially interested in hearing more about your flower therapy workshops. 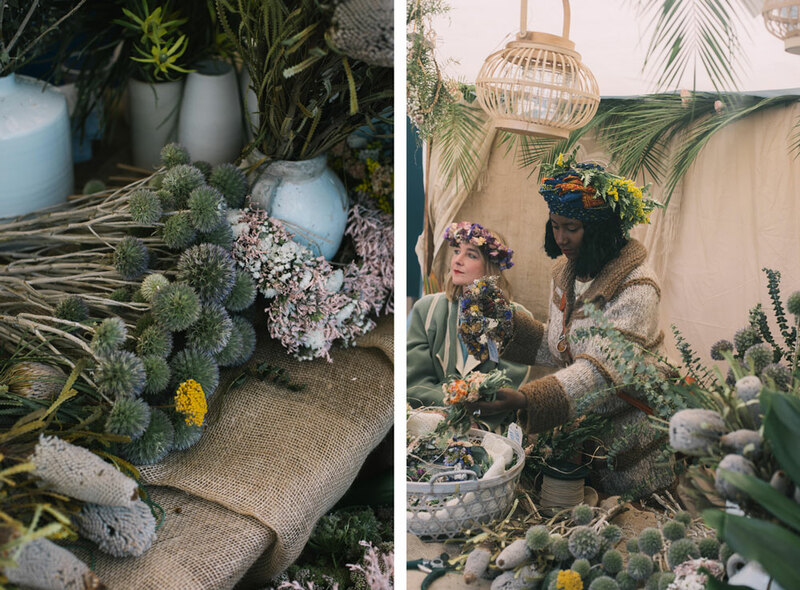 Maggie: Our services include interior, flower styling, makeovers (we’re currently doing a makeover for a local café), wedding flowers, event planning, dinner decor, workshops, editorial product styling, fashion photo shoots and installation pieces. 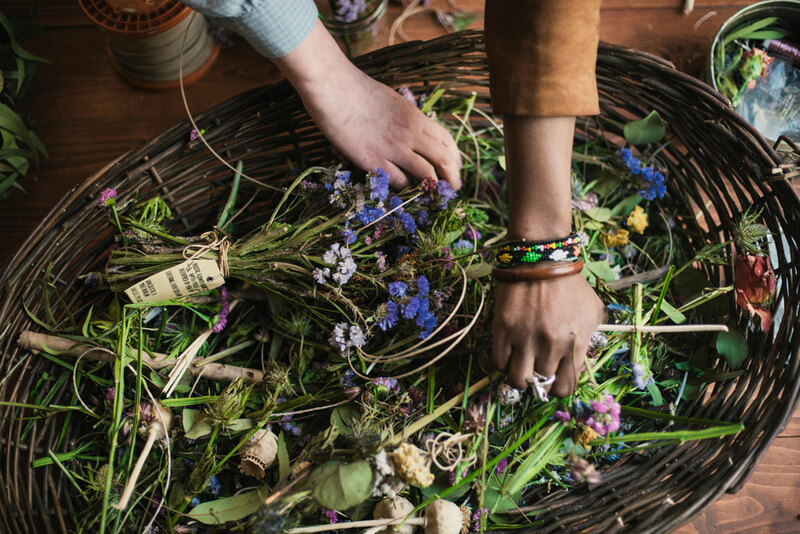 Our Flower Therapy Workshops are a space where people can come to reconnect with themselves by deepening their connection with nature and their creative spirit. 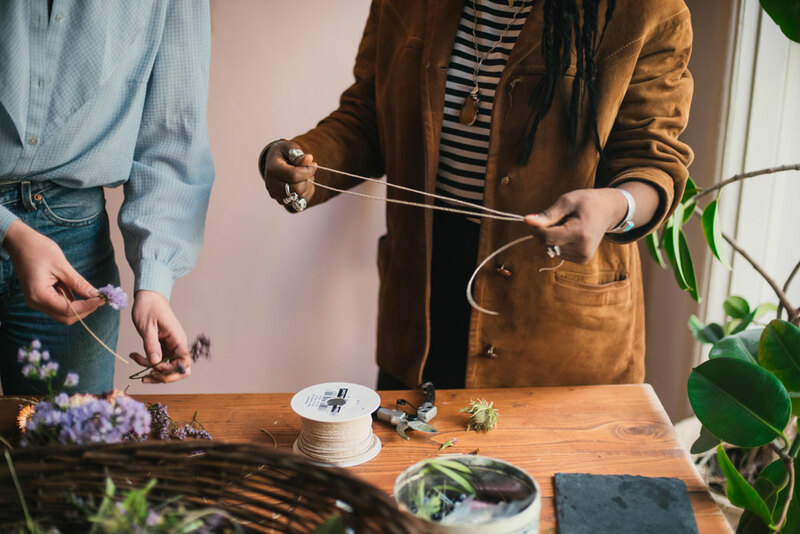 When we go back to the basics of crafts and working with our hands to create, more often than not your inner child spirit is released – the inner child who is not afraid to make mistakes or experiment with colours and shapes. Aside from our flower fanatic clients, a lot of our attendees have been people working in finance, IT and even diplomats. It’s always interesting to see how long it takes for people to relax and not be too harsh on themselves in the making process. We tell them in this space there is no perfect wreath or bouquet, just your pure honest creative expression. A time to free your mind of self criticism ,a time to clear your head from the work week you left behind or the week you anticipate ahead. We’re here to gift ourselves with slowdown time. The results are always so different and beautiful. 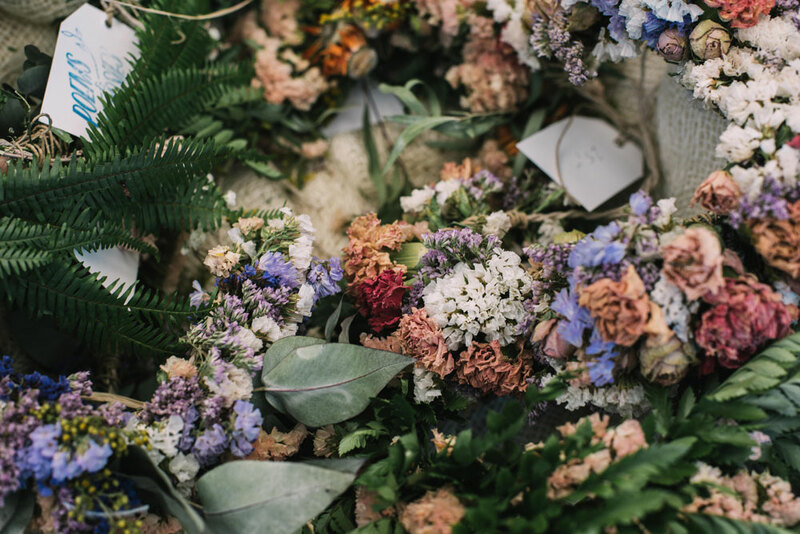 We use all dried flowers, so the attendees get to keep their pieces for potentially a life time. The sharing circle we do at the beginning of the workshop gets everyone warmed up to each other and, more often than not, people exchange contacts by the end of the session. 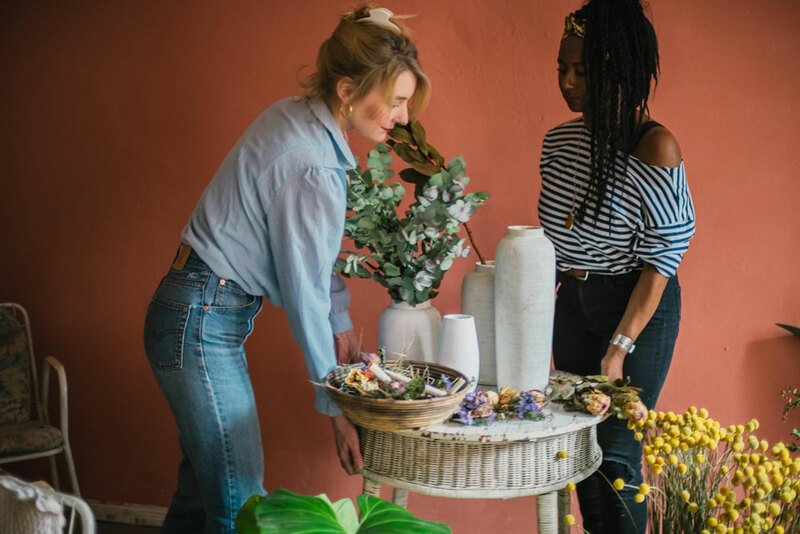 When approaching a styling project, what are your first steps and how do you work with your customer to make sure their taste is also reflected? Jasmin: We start with a free consultation to find out what the client wants. 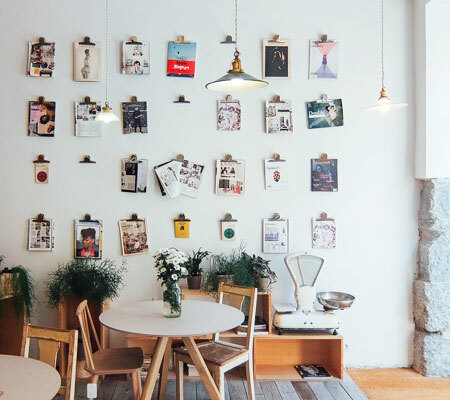 Once we feel we have a good enough picture of what they think they want, we go away to brainstorm and then we both throw our visions onto a mood board proposal for the client. When we get the feedback from the client, and if they are happy with our suggestions, we move to the second stage of pricing and contracts – this can usually have a little back and forth. Berlin is a city which seems to have a limited understanding of how much effort and hard work goes into working with flowers and botanicals. Also, most people, unless they have been to a large flower market, have no idea about how expensive flowers can be. They just see the pretty side and end results, but can’t imagine you having to wake up at 4am in the morning to buy flowers or leave your studio at 2am the night before a big job. I think this could be because it’s only in recent years that Berlin is picking up on interior trends or hiring flower stylists for events. 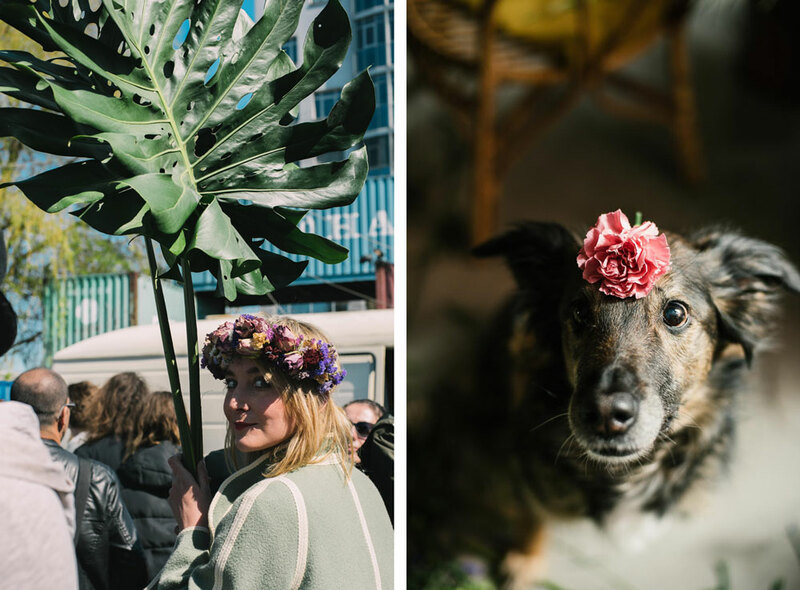 But there appears to be no understanding about this type of work or services – we once got a request for a large bridal bouquet and table decor and the budget was 50€. We truly appreciate all work that comes our way, but sometimes it’s just not possible to make it happen. For weddings, we often ask the bride or groom for pictures of the venue, outfits, dream flowers and bouquet but, most importantly, a list of colours and flowers they both dislike! Once we’ve booked the job, we visit the venue to get a real feel for the place, which is something you can’t get from a picture. We try to have as many conversations with the clients as possible – the more we know them, the better translation of their vision. Although on many occasions we have been blessed with full trust based on our past work, which is a massive compliment and makes us so grateful for all the wonderful photographers we’ve worked with. In particular our friend and talented photographer Sasha Kharchenko. What are some of your favourite projects you’ve worked on? Maggie: H&M Showroom Fashion Week 2016 and Soho House. We also did a big wedding at Charlottenburg Palace, the largest palace in Berlin, and we were only a team of three people including ourselves. However, we managed to pull it off using every last minute and second of set-up time so I felt pretty proud of our team effort and spirit. Also our food partners, catering company Wild & Weise, were so kind and gracious to work with. Jasmin: H&M Showroom is also a favourite, along with Sleek magazine and I am plus headphones for will.i.am – that was something totally different from what we had been doing before. I also enjoyed Adidas because we worked again with the catering company Wild & Wiese, who totally complement the style of Poems & Posies. And decorating the lounge area for Future Islands was amazing. I’m such a huge admirer of their work and meeting them I think was the cherry on top – I can finally die happy. How do you see the relationship between flowers, people and spaces changing over the next few years? Have you identified any particular trends? Maggie: It’s actually hard to say. 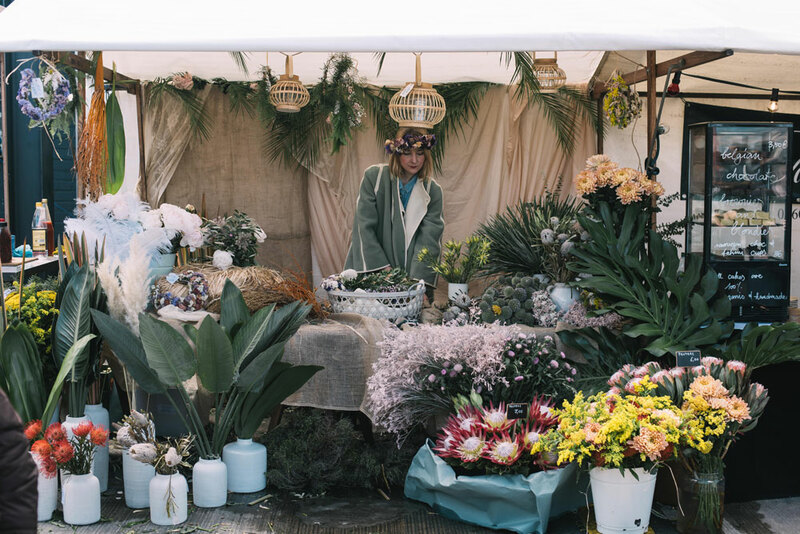 We both think flowers will remain present on catwalks and editorials for years to come – it’s something we noticed in fashion in 2014 and it’s still popping up now on big runways like Christian Dior in 2012. Of course with social media you can see the trend of flowers spreading like wild fire so maybe it will become a big yawn, or we just need to continue finding new ways to keep it exciting. Hopefully people will become more mindful of waste. I’m sure if you were to go dumpster diving each week you could gather a few bouquets in pretty good shape. 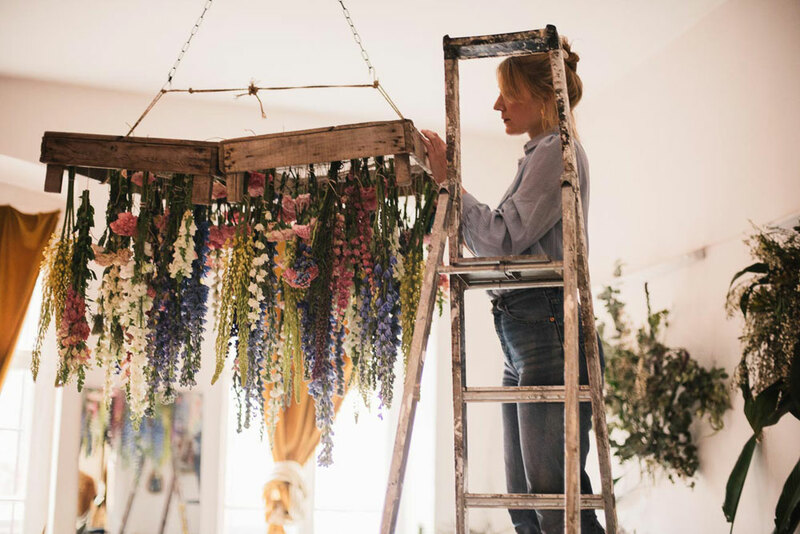 We know we’re not making a massive imprint on sustainability, but we try to do our bit by saving and drying our flowers, then using them for workshops or installations. We have built up a good number of café clients for dried flowers arrangements, which saves them heaps of money and time. Jasmin: We have noticed that we have influenced the trend of dried flowers in Berlin so maybe more places will follow. Our shop and studio is full of dried flowers and proof that dried flowers can make a space look vibrant and beautiful. 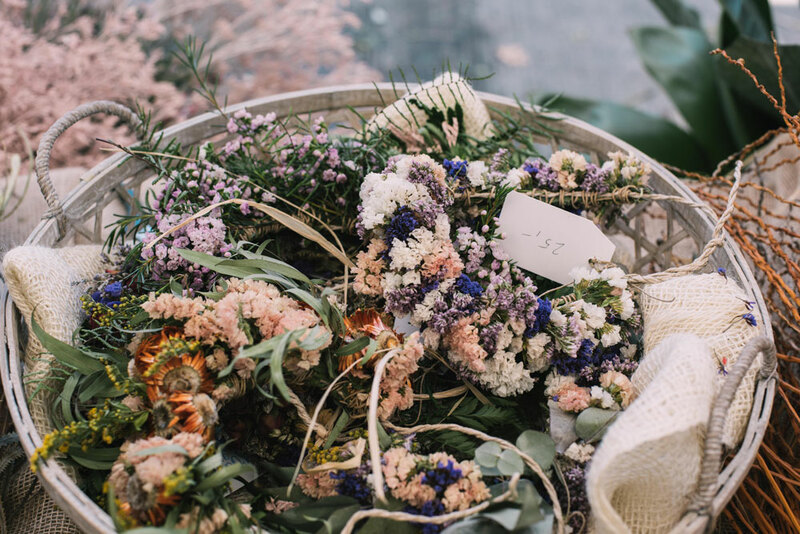 We think there is more of an appreciation for dried flowers in Japan. They know how to make it look so aesthetically beautiful with interior styling. We love the hues and often sandy textures. One more thing we both hope for is to build a relationship with a farmer and grow our own flowers, so maybe more local flowers will start popping up in the next few years. Ideally it would be great to have our own farmhouse for workshops and retreats. Can you share with us some of your plans for the upcoming months? Maggie: We have had some offers to work abroad doing installations, workshops and pop-ups. Locally, we’re collaborating on some dinner projects and have some big weddings in the countryside coming up in the next couple of months. What are some of your favourite spots in Neukölln? Maggie : Paul-Lincke-Ufer for a stroll along the canal, Maison Han for coco milk ice latte (and also delicious food), and two ‘trodel’ shops on Pannier strasse 14 & 8 for vintage furniture shopping and other gems. I also love Senegambia Imbiss (in Kreuzberg) for their delicious Senegalese and Gambian dishes – reminds me of my dad’s cooking. Jasmin: The Leine strasse old graveyard for picking wildflowers whilst walking my dog, a beautiful French eatery called L’eustache in the Schillerkiez for dinner, Veist vintage is a real hidden gem for hand-selected vintage pieces. And I also love Rag And Bone Man’s selection by Johanna Hagman, simply one of a kind.